As the only airport located in the capital, London City Airport advertising provides unrivalled reach to some of the world’s most influential business passengers. Situated just three miles from Canary Wharf, London City Airport is at the heart of the world’s most powerful financial centre. Predominantly serving the business community, London City Airport advertising offers brands a fantastic opportunity to target a wealthy and influential audience. London airport advertising offers you brand exposure on both a domestic and international scale, with London City operating flights to several destinations across the UK, Europe and the USA. In 2014, the airport served 3.6 million passengers – an 8% increase on the previous year, with visitor numbers continuing to grow. Advertise in London City Airport and reach passengers on its prestigious British Airways business class-only flight to New York’s JFK Airport. London airport advertising offers your brand a unique opportunity to reach a predominantly business-focused audience, with almost 70% of flyers travelling on business from London City. 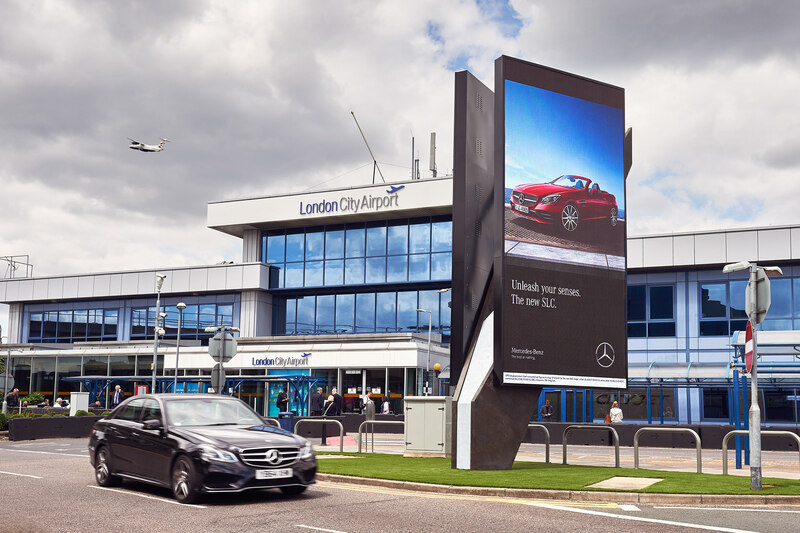 With a range of innovative media solutions available, including digital and traditional advertising formats, London City Airport advertising provides opportunities for campaigns of all sizes and budgets. Advertise in London City Airport for a campaign that offers unrivalled access to a desirable audience in terms of corporate decision-making power and personal wealth. 87% of London City Airport passengers are AB, with an average salary of £92,000. Located in between the City of London and Canary Wharf, London City Airport is situated at the heart of the capital’s financial industry. The airport handles business flyers travelling to and from London from around the globe – advertising at London City Airport allows your brand to make an instant impact on international passengers. Airport advertising is a great way to influence purchases, encourage investment and raise brand awareness on a domestic and international scale. With 98% of passengers carrying a mobile device, your London City Airport advertising campaign can drive traffic to your website or social media channels by targeting an audience with time to kill and money to spend. We work with a range of exciting advertising solutions to ensure that your London City Airport advertising campaign delivers excellent results for your brand. To find out more about our available formats or to discuss your options in more detail, get in touch with Transport Media today over the phone or by online contact form.